During the NASCAR offseason, a bunch of headlines were generated about the surge of young talent invading the Monster Energy Cup Series. Kyle Busch told everyone during the NASCAR Media Tour that despite the influx of young guns, the veteran drivers still have what it takes to get the job done and were still worthy of being a big part of NASCAR's promotional campaign. His comments generated quite a bit of chatter throughout the industry. This past weekend in Atlanta, Busch's remarks were validated as a group of veterans put a stranglehold on the top 10, demonstrating to fans that they are still here and certainly aren't about to step aside and give way to the rising tide of baby-faced challengers. Kevin Harvick, a past series champion who has a pair of victories at Bristol Motor Speedway, dominated the Atlanta race, taking his first checkered flag there since 2001. 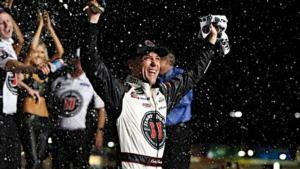 He was followed across the finish line in order by seven other notable veterans, including Brad Keselowski, Clint Bowyer, Denny Hamlin, defending champ Martin Truex Jr., Joey Logano and Kyle and Kurt Busch. Harvick said the strong finish by the veterans doesn't necessarily make any kind of statement, but that he feels the sport needs a good variety of winners, both young and old, to satisfy its vast fan base. "We're in a great spot in our sport, and I think (at Atlanta) there was a lot of experience," Harvick said following his win. "Next week there will be a lot of young guys in the mix with a racetrack that's a little calmer with things you don't have to have in your memory bank. But we're in a great spot in our sport because we have these young guys that are fired up and can drive the car fast and have great stories and have ties to great family heritage of our sport, and you have guys that you've never heard of. And that's what you have to have. "The diversity from young to old is something that we haven't had in a long time, and we're going to corral everybody to make sure that they realize that we all need each other in order to make this sport all that we want it to be." The veteran feels that experience is the key to success at Bristol, a track where templers can flare and unpredictability is at its highest. "You never know what's going to happen," said Harvick, whose last Bristol win came during the 2016 Bass Pro Shops NRA Night Race. "Things are happening so fast. Cars tend to run into each other. Things happen at Bristol that don't happen anywhere else." At Bristol, the past four races have been claimed by veteran drivers. Last season Jimmie Johnson won the Food City 500 at the controls of his No. 48 Lowe's Chevy and Kyle Busch was dominating during August's Bass Pro Shops NRA Night Race in his No. 18 M&M's Toyota. Fans should expect another strong showing by the tough old guard when NASCAR's best drivers compete in the 26th annual Food City 500, April 13-15, 2018 at The Last Great Colosseum. Busch, a winner of 43 Cup Series races, including six victories at Bristol, narrowly missed claiming his second Cup Series championship last November in Homestead, Fla., and says he's in the prime of his career. He feels like he has a great handle on how to race at Bristol and knows that his experience on the .533-mile oval will be very beneficial when the green flag drops. "You've got to be adaptive in this sport," Busch said. "I think that kind of lends itself a little bit maybe towards veteran drivers, but I think also it lends itself to the younger driver, too, because they don't know what to do. They don't know what to expect. They just drive the hell out of it. They don't know really how they want their car to feel. They just figure it out as they go. It all comes around, and the guys that are good and forever will be good are always good." "It's so wild, I was once the young gun," Johnson said. "Every time I'd see my name written, it was Rookie Jimmie Johnson. Now I'm grandpa. It's gone fast. But my desire to be competitive, my desire to be a champion, my desire to win races, has never wavered. That's who I am, it's what I am." The veteran drivers will be joined on the track by a host of NASCAR's vaunted rising stars, including Kyle Larson, Ryan Blaney, Daytona 500 winner Austin Dillon, Chase Elliott, Alex Bowman, Daniel Suarez, Erik Jones, Ty Dillon, William Byron and Bubba Wallace, driver of the No. 43 machine for legend Richard Petty. In addition to the great racing, there are so many cool options to make a complete weekend of family fun, including great video entertainment provided by Colossus, the world's largest center-hung video screen, premium VIP experiences like the Chairman's Experience, tailgating, on-site camping, concerts, great food and beverages in the concession stands throughout the property, and so much more.